Are you new to riding? 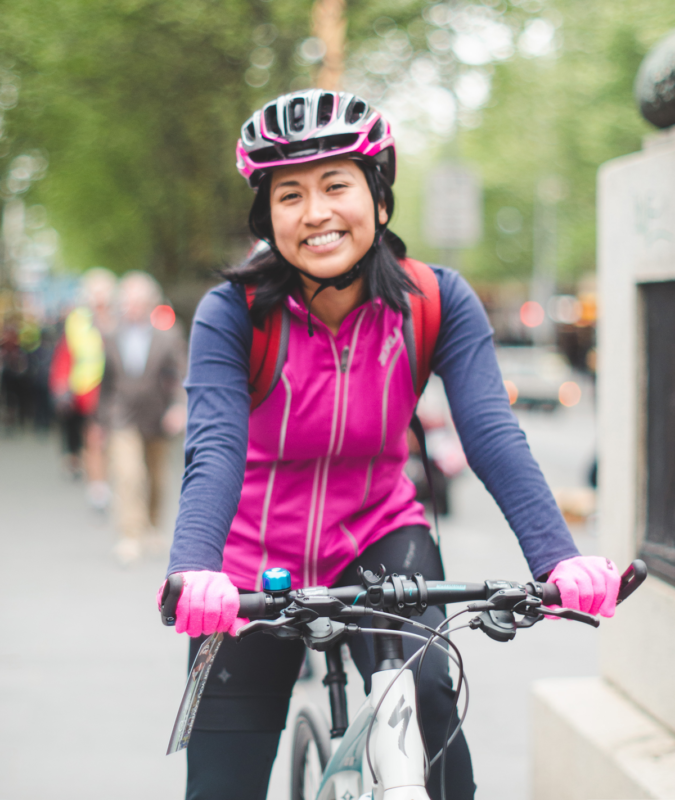 Here are the answers to the most frequently asked questions about riding a bike to work. Riding to work is not a race — take it easy and use the gears. Your fitness and health will build over time. Long-term health benefits include increased strength, improved muscle tone, decreased body fat and reduced risk of disease. You need a bike (new or old), a helmet and a good lock. You’ll also need front and rear lights, and a rear red reflector to be visible in dark conditions. A well fitted bike is a dream to ride, so get the size and seat height right. Serviceable brakes, tyres and chain save worry and trouble. Ask your local bike shop for advice and possibly a bike service. Note that bicycles must have at least one effective brake and a working bell. How do I carry my stuff? If you’re travelling light, try a backpack, courier-style bag or bike basket. Panniers (bags that can be fastened to a rack) are great for larger loads. Bike trailers or cargo bikes can be considered to drop the kids off or carry heavy work materials. What if my office doesn't have adequate parking facilities? 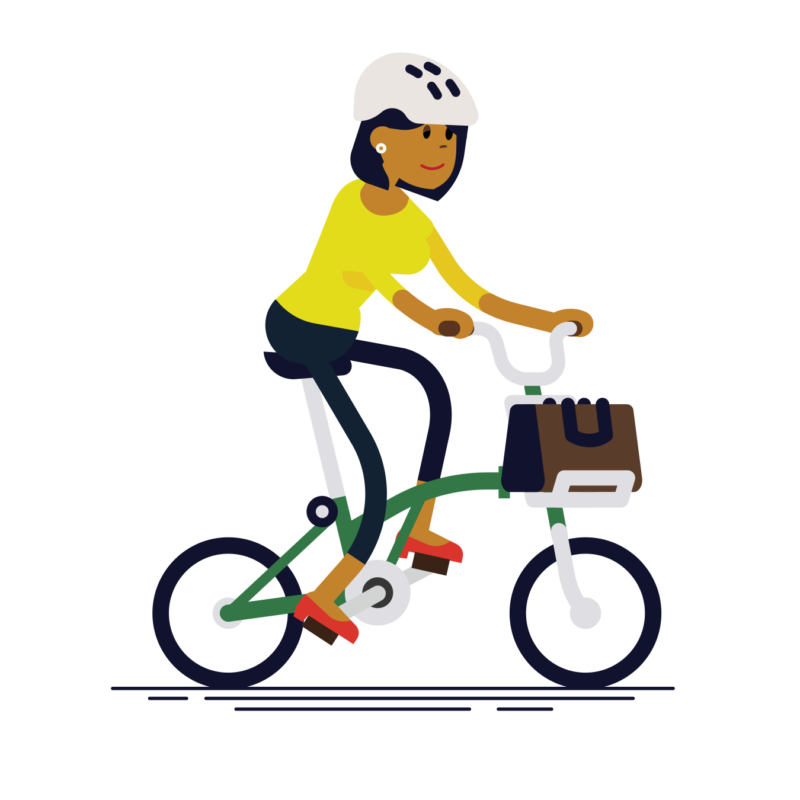 Bike-friendly workplaces have huge benefits to both employees and employers from improving physical health to productivity. Our bike parking experts have over 20 years experience and can help install bike parking and post-ride facilities in your workplace. 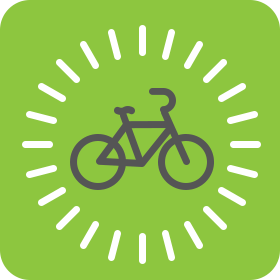 Bikes are generally faster than cars or public transport in the congested peak travel times if your trip is less than 15 kilometres. You’ve also done your exercise for the day so you don’t need to find time to go to the gym. Wear clothes that are unrestrictive, light, warm and dry quickly. Wear bright and light coloured clothing and something reflective. You can ride in work clothes or change at work. You can carry a fresh change of clothes with you or bring them in once a week by public transport or car. 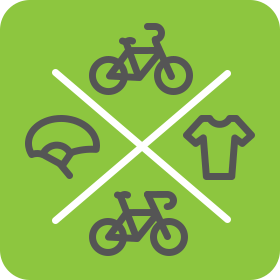 Ask other riders in your workplace about facilities for changing, showering and storing clothes. Tip: Reflective ankle bands are a great idea to stop your trousers from getting caught and gloves are essential in the colder months. How do I plan my trip? 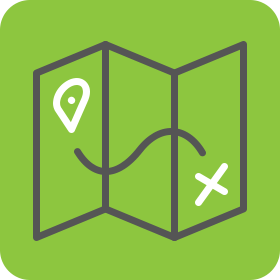 Start by speaking to regular riders and checking out maps available from your state/territory cycling organisation or local council. Aim for a route that avoids traffic and narrow roads. You might be able to utilise off-road bike paths and on-road bicycle lanes. Someone who rides in from your direction might be happy to show you the ropes. Consider doing a trial ride on a weekend. If you need support finding people in your local area who are willing to buddy up as you start riding, get in touch and we’ll help you out. Do I live too far away? Part way is OK. Jump on the train with your bike in the morning, and get off at a reasonable distance from work and then ride. Perhaps drive in part of the way and ride from there. Riding to the train station is a great idea. Some people reduce the distance per day by riding only one way each day. Wear a rain jacket, preferably with underarm vents and reflective or bright panels. Take a change of clothes for your legs or wear waterproof overpants. Exercise extra caution, just like when you drive a car in the wet. Avoid metal surfaces such as tram tracks and drains. If it rains at the end of the day and you’d rather not ride, leave your bike at work and ride home the next night or take your bike home by train. What about riding in traffic? Common sense: Bicycles are recognised as vehicles and must follow the rules of the road. Riding on the left, obeying traffic signals and using hand signals before turning right are all essential for reducing risk. Courtesy: Be assertive but considerate by knowing the road rules and acting on them. If you make eye contact with motorists you can be more confident that they’ve seen you. 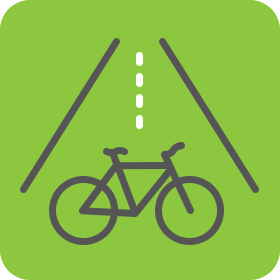 Caution: Find a low risk route – try quieter streets or off-road bike paths. Ride predictably and leave yourself room to manoeuvre. Try to be aware of what’s happening around you and look ahead. Watch for opening car doors. If possible, ride out from the door zone – a car door is about 1.5m wide. If you can’t do this, then slow down to a speed where you can stop in time. What if I get a puncture? Modern puncture-resistant tyres are so good you can ride enormous distances without a flat. If you do get a puncture and you’re carrying a basic repair kit, you can replace the tube or repair the old one quite quickly on the spot. If you haven’t learned how to repair or replace a tube, devise an action plan. 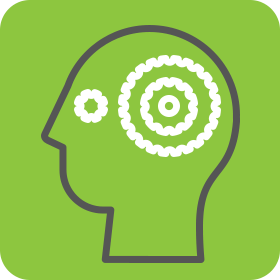 This might involve carrying a mobile phone or knowing where the nearest train station or bike shop is located. 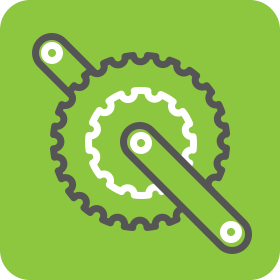 See our Tips & Resources for more information on bike maintenance and mobile mechanics. Delicious home-grown bananas are nature’s energy snack and the perfect alternative to unhealthy processed food and drinks. They are perfect before, during and after a ride to give you lasting energy and help refuel the body. If you normally have a long ride to work, then you’ll need to fuel up well before you get on your bike. Start the day with a healthy breakfast such as a bowl of cereal with low fat milk, chopped nuts and a sliced banana. On Ride2Work Day you could start with a light breakfast, such as yogurt and banana, and then top-up at one of the many Ride2Work Day official breakfasts. You can sweat a lot during a ride, especially in warm weather and if you ride with a backpack. Stay hydrated by drinking water frequently. Dehydration will increase the risk of a stitch and cramp. You will need about 600mL of fluids for every hour you ride. More in hot weather. It is wise to take two drink bottles with you so you are covered for a warm ride. Researchers gave either a sports drink or water and two bananas to cyclists on a 70 km timed ride. The cyclists did equally well on either, showing that we ride well when we consume both carbohydrate and water. It didn’t matter if the combination came as water and banana, or a commercial sports drink. To quickly hydrate after your ride, have a cup of tea or coffee when you arrive at work. It is a myth that tea and coffee will dehydrate you. Of course, water is a great choice too. Keeping drinking until you pass light-coloured urine. Only then are you likely to have replaced all of your sweat losses. Preparing for National Ride2Work Day 2018? We’ve created a suite of FREE posters and digital images to help you promote your Ride2Work Day event in your workplace. New to the world of bike riding? Let us set you steady for your life on two wheels. 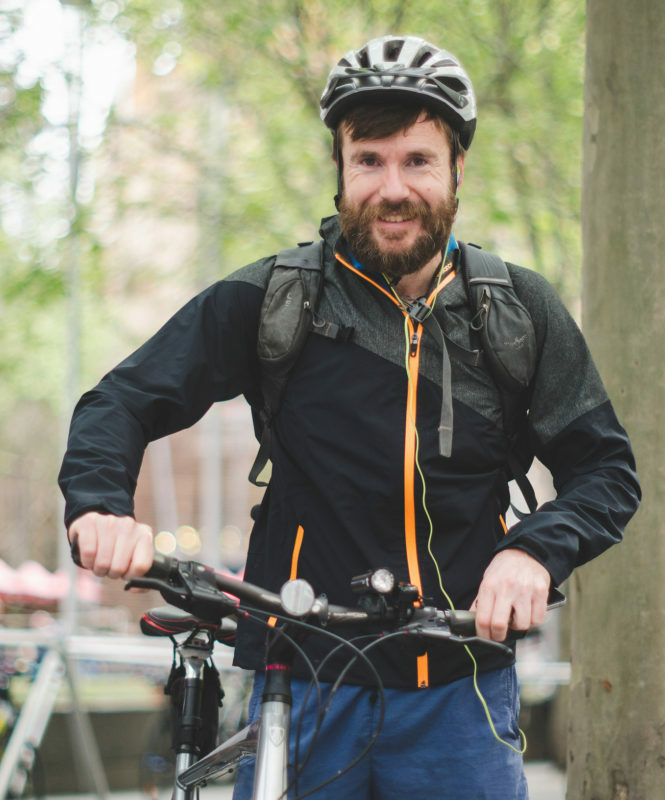 Bicycle Network brings you reviews of the latest bikes and gear after rigorous field testing to make bike riding easier for you. Your source of bike road rules and laws as defined by states and territories around Australia. From puncture repairs to cleaning your bike, we've gathered some great resources to keep your wheels spinning smoothly. A list of maps and cycling resources to help you find the best places to ride in your local area. Here's some tips and advice to get the most out of your time on two wheels.